National power is defined as the sum of all resources available to a nation in the pursuit of national objectives. 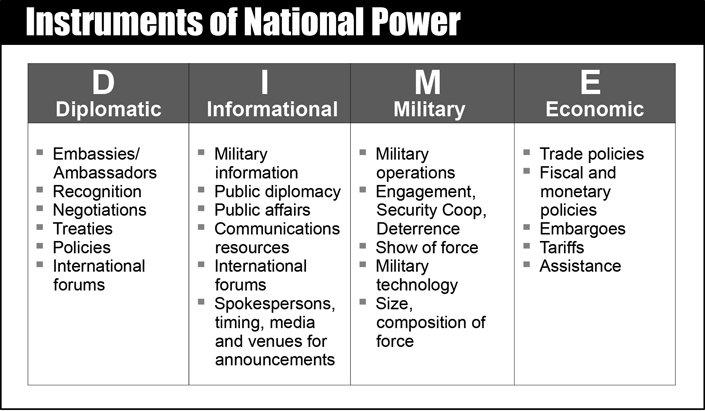 National power stems from various elements, also called instruments or attributes; these may be put into two groups based on their applicability and origin – “national” and “social“. National includes geography, resources, and population. Social includes economic, political, military, psychological and informational. The phrase instruments of national power refers to the tools a country uses to influence other countries or international organizations or even non-state actors. The United States National Security Strategy (NSS) is a mandated by Congress and is the principal document that lays out how the President plans to use the instruments of power to achieve US National Security objectives. The most recent NSS (December 2017) is available via the White House Web site. In the American perspective, the instruments of national power are: Diplomacy, Information, Military, and Economic (DIME). According to Joint Publication 1, The ability of the US to advance its national interests is dependent on the effectiveness of the United States Government (USG) in employing the instruments of national power to achieve national strategic objectives. The appropriate governmental officials, often with NSC direction, normally coordinate the employment of instruments of national power. Information remains an important instrument of national power and a strategic resource critical to national security. Previously considered in the context of traditional nation-states, the concept of information as an instrument of national power extends to non-state actors—such as terrorists and transnational criminal groups—that are using information to further their causes and undermine those of the USG and our allies. DOD operates in a dynamic age of interconnected global networks and evolving social media platforms. Every DOD action that is planned or executed, word that is written or spoken, and image that is displayed or relayed, communicates the intent of DOD, and by extension the USG, with the resulting potential for strategic effects. The US employs the military instrument of national power at home and abroad in support of its national security goals. The ultimate purpose of the US Armed Forces is to fight and win the Nation’s wars. Fundamentally, the military instrument is coercive in nature, to include the integral aspect of military capability that opposes external coercion. Coercion generates effects through the application of force (to include the threat of force) to compel an adversary or prevent our being compelled. The military has various capabilities that are useful in non-conflict situations (such as in foreign relief). Regardless of when or where employed, the Armed Forces of the United States abide by US values, constitutional principles, and standards for the profession of arms. A strong US economy with free access to global markets and resources is a fundamental engine of the general welfare, the enabler of a strong national defense. In the international arena, the Department of the Treasury works with other USG agencies, the governments of other nations, and the international financial institutions to encourage economic growth, raise standards of living, and predict and prevent, to the extent possible, economic and financial crises. The routine interaction of the instruments of national power is fundamental to US activities in the strategic security environment. The military instrument’s role increases relative to the other instruments as the need to compel a potential adversary through force increases. The USG’s ability to achieve its national strategic objectives depends on employing the instruments of national power discussed herein in effective combinations and all possible situations from peace to war. At the President’s direction through the interagency process, military power is integrated with other instruments of national power to advance and defend US values, interests, and objectives. To accomplish this integration, the Armed Forces interact with the other departments and agencies to develop a mutual understanding of the capabilities, limitations, and consequences of military and civilian actions. They also identify the ways in which military and nonmilitary capabilities best complement each other. The NSC plays key roles in the integration of all instruments of national power, facilitating Presidential direction, cooperation, and unity of effort (unified action). Political and military leaders must consider the employment of military force in operations characterized by a complex, interconnected, and global operational environment that affect the employment of capabilities and bear on the decisions of the commander. The addition of military force to coerce an adversary should be carefully integrated with the other instruments of national power to achieve our objectives. The military instrument of national power can be used in a wide variety of ways that vary in purpose, scale, risk, and combat intensity. These various ways can be understood to occur across a continuum of conflict ranging from peace to war. Inside this continuum, it is useful from a strategic perspective to delineate the use of the military instrument of national power into three broad categories. Mindful that the operational level of warfare connects the tactical to the strategic, and operations and campaigns are themselves scalable, the US uses the construct of the Range of Military Operations (ROMO) to provide insight into the various broad usages of military power from a strategic perspective. 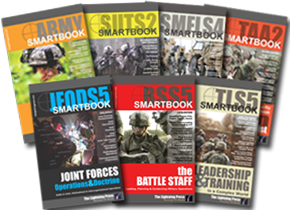 SMARTbooks can be used as quick reference guides during operations, as study guides and lesson plans at professional development courses, and as checklists in support of training. Serving a generation of warfighters, our military reference books have spanned the globe with more than 500,000 copies sold.